While clicking through the collection of today’s Fresh Signals from Coudal Partners, I saw that they were linking to a Globe and Mail article about the Fogo Island Arts Colony and the architectural work of Todd Saunders. A mission of Shorefast, a non-profit that fosters social entrepreneurship, is to provide visiting writers and artists time and space to do their work while breathing new life into a community hit by the cod fishery collapse and out-migration. Instead of outport, Cobb wants us to consider the communities of Fogo and nearby Change Islands as places of intake. Having been Jo Batts Arm, the community on Fogo Island hosting Cobbs vision, just last summer, I can confirm that none of the descriptive imagery is invented. Though much of the island of Newfoundland is rocky, rugged and sparse of trees and vegetation, Jo Batts Arm is something well beyond that. It’s a place mostly without trees or grass, without almost anything to distract your eye from its two prominent elements: rock and ocean. 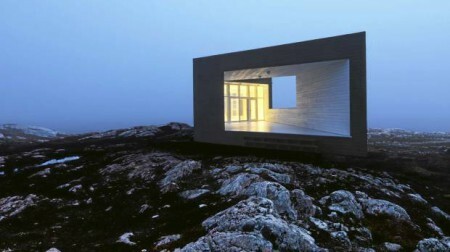 Maybe it’s just luck or good fortune that Cobb chose to come back to her home to invest in this project, or maybe this tiny little community on Fogo Island, Newfoundland is the perfect blank canvas for artists looking to create in almost complete sensory underload.